"It's very embarrassing. It's as embarrassing as hell," Willard said. "But let me say this: Nothing happened. I did nothing wrong. Everything is being sorted out as we speak." 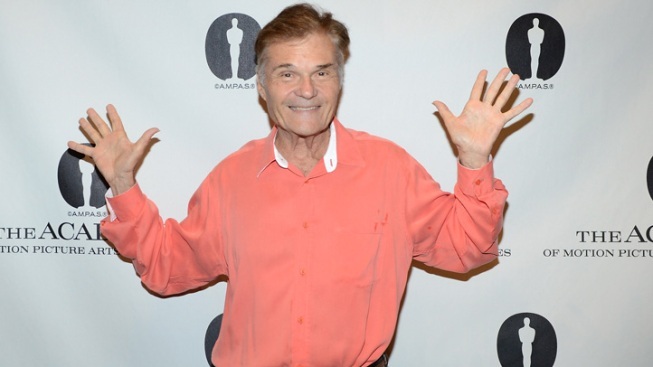 Actor Fred Willard, pictured here at The Academy of Motion Pictures Arts and Science's "The Last 70mm Film Festival," is hosting "Trust Us With Your Life," an improv series airing this summer on ABC. Fred Willard said his recent lewd conduct arrest at an adult movie theater was "very embarrassing" but insisted he did nothing wrong. "It's the last time I'm going to listen to my wife when she says, 'Why don't you go and see a movie?'" Willard said during an appearance Thursday on Jimmy Fallon's NBC show "Late Night." The 72-year-old actor and Fallon cracked racy jokes about possible titles for the movie that might have been playing when Willard was arrested July 18 during a routine check by police at the Hollywood-area theater. Then the conversation turned serious for Willard, whose credits include the movie "Best in Show" and guest roles on "Modern Family" and other TV shows. "Fred, I know this must be a tough time," host Fallon asked. "It's very embarrassing. It's as embarrassing as hell," Willard replied. "But let me say this: Nothing happened. I did nothing wrong. Everything is being sorted out as we speak." He has great respect for the police, Willard added, "but if you're in the wrong place at the wrong time, everything seems suspicious." He's tried to laugh it off but the incident is "very painful," said Willard, who was fired as narrator of the new PBS series "Market Warriors" immediately after his arrest. The Los Angeles City Attorney's office determined that Willard's case was eligible for a diversion program that will keep him from being formally charged with lewd conduct if he completes the required courses. Willard will pay $380 for the program. Talk shows can be useful for celebrity efforts at damage control. In 1995, Hugh Grant visited Jay Leno on NBC's "Tonight" after being arrested with a prostitute on Hollywood's Sunset Strip. Fallon was sympathetic to Willard. "You're a good man. ... You're one of my favorites," Fallon said, then needled him with, "You can come to our show and do whatever the heck you want, except for certain things." Willard was nominated four times for Emmys for guest roles on "Modern Family" and "Everybody Loves Raymond." In Pixar's 2008 hit "WALL-E," he voiced the character of Shelby Forthright, the CEO of a ubiquitous big-box chain called Buy'n'Large. In addition to "Best in Show," Willard has also appeared in other Christopher Guest mockumentary films, including "This is Spinal Tap" and "Waiting for Guffman." Willard is hosting "Trust Us With Your Life," an improv series airing this summer on ABC.